Friendly bartenders and unpretentious patrons, this laid-back attitude neighborhood bar is a welcoming spot for all. Love ! Love !! Love !!! This Place. One of my favorites, once I moved to SF. Great to meet friends and most of the Bartenders are great. When I was a SF resident this was the favored place to go for my friends and I. It looks like a hole-in-the-wallish from the street, but the back patio is the real draw. It's low-key and attracts a wide variety of people. i met a few people here the night before folsom and had a fantastic time there. also went back and had a drink with a fella and got lucky. If you are anywhere near the Castro do yourself a favor and AVIOD this bar. My boyfriend and I decided to visit this bar last Sunday and we were not finished with our drinks when the bar owner Larry appeared and threw a bar stool across the bar at the bar tender in a rage! The bar staff were rude and we left our drinks half full at the bar and headed down the street to Toad Hall where we were able to have a couple of drinks without the threat of bar furniture being thrown at us by the owner! 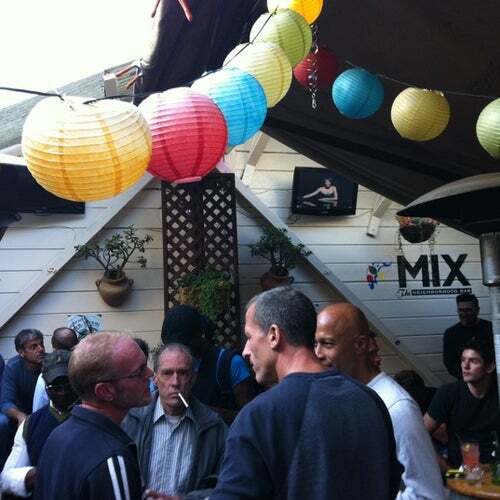 Mix bar is a very small bar that is the perfect place to hang out with your friends. There are not a lot of sitting space if you are newcomer to the bar because the back patio is crowded with regulars. Sunday beer bust costs 10 dollars. A great relaxing place to go with your friends when you do not want to be around all the craziness. Unless you are a regular and the staff happens to personally know and like you, you don't have much good service coming your way. Most of the "few" bartenders working there are very snobbish. The regulars are very click-ish and unless you're part of their "table" and/or group, you get no smiles or conversation from them. I know all too well about this bar as I used to be a regular and I will say a good and nice regular one also. On the other hand, a few "new" staff seemed very sweet while I was there...Would I recommended to a friend, NO! There are more pleasant friendly bars in SF to ck out. This place is truly a mix of everything the Castro has to offer. Every stereotype can be found here on almost everyday of the week. Go to the back patio and you will find the loyal regulars smoking and drinking after they get off work till around 10. Get there before happy hour ends at 7, as they&#039;ve recently up&#039;d the prices and are one of the more expensive bars in the Castro now. The same $2 Miller Lite you got at 440 will run you $5 here outside of Happy Hour. I always have fun here!